One hand reaches out to hold another, a gesture as quotidian as it is intimate. The content of Alain Urrutia’s Hold Me (2014) does not reveal much concrete narrative, yet implies a plethora of possible backstories. Many of Urrutia’s paintings depict enigmatic and mysterious scenarios that aim to open up possibilities for a multitude of meanings rather than communicate an empirical truth. In this particular painting, the simple gesture of hand-holding provides a wellspring of connotations – but no answers. Hold Me has the appearance of a close-cropped film still. Black and white with a wide range of tonal variation, this painting could depict snapshot from one of Hollywood’s golden age films: one with confounding plot twists, men who talk out of the side of the mouth, and women who talk as if on the verge of fainting. The grid lines that have been left visible recall, of course, the compositional tool behind many classical paintings, and may have been used to that end. But also, the lines recall the reign of the modernist grid, a style contemporaneous with the golden age of Hollywood. Thus, the exposed grid lines also suggest that this image has been or will be edited, post-production. In fact, Urrutia has been known to do exactly that – edit a once-finished painting by physically cropping it (unstretch, cut, restretch) as one might have done with an analogue photograph taken from a film. What remains of this picture blurs against stark black edges that frame the image on all sides. The intense light that falls upon it blows out the detail of the top hand. Yet, there is enough in its shadowed dorsal edge to suggest that this hand might belong to someone who is not young. Extending itself from what looks like a suited arm, the hand could belong to a man. (The first apocryphal connotation that will inform all the rest: suits are usually worn by men.) The type of man who wears suits today might be implicated as corporate, serious, or wealthy. Another possibility is that this man is looking to impersonate serious, wealthy, or corporate men, perhaps for an important occasion. On the other hand, Hollywood-era film might lead one to believe that all men wear suits, regardless of their status or the occasion. The hand being grasped is all but limp, resting on a soft-looking surface. It doesn’t signify a particular gender as much as it implies age. After all, its rough-knuckled fingers look as if they belong to a worn, overworked person past the point of feigning delicacy. This flaccid hand suggests its wearer might be sad, solemn, sleeping, or even dead. The embrace – one hand on top of the other – first reads as an attempt to comfort, for example, the big city businessman goes back to his hometown to comfort a dying childhood friend. However, (plot twist – if you will) this embrace could also be a warning. The big city businessman might have gone back to ensure his childhood friend won’t be revealing any details of their humble beginnings. Even still, the hands could belong to two nuns, or a nun and a remorseful sinner, begging to be forgiven. And so the depiction of this gesture, mundane in its content, but intriguing for its plethora of possible significations, leaves almost everything to the viewer’s imagination. We have no idea what we are actually looking at, and so we are allowed to invent it. In real life, hands aid the voice and the body in the elocution of expressive language. 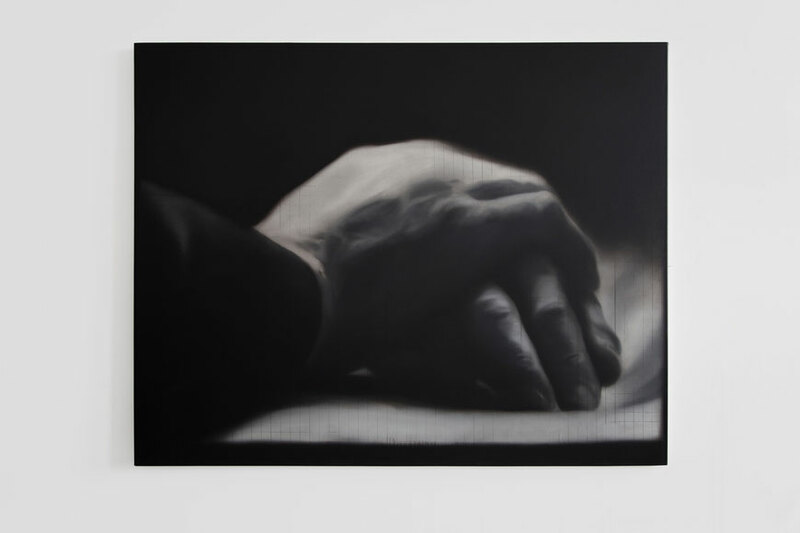 But here in Urrutia’s painted world, in the absence of either of those – the voice or the body – these hands don’t communicate a specific thing. They communicate any thing. Urrutia gives so little contextual detail in the painting that viewers are allowed to run away with their own individual fantastical connotations. These connotations are residues of assumptions left behind by societal norms force fed through mass media imagery, embedded within specific cultural contexts. For example, the top hand could belong to Humphrey Bogart in The Barefoot Contessa in 1954. It could just as well belong to Isabella Rosellini, as herself, today. (Popular biology purports a sexual dimorphism between a male and a female hand based on the length of each finger and the ratio of those individual lengths to each other – but Urrutia doesn’t even give us that much information to extrapolate with.) But even those options, Bogart of the 1950s or Rosellini today, rest on a reading of the image that situates it within the cultural codes pumped out by the American film industry. Age, epoch, gender and nationality all are categories that provide order but none are strictly empirical or essential. All can be – and should be – obscured, twisted, and freed from their normative trappings. Detach yourself from the need to make sense of things, the painting almost begs. And so what’s most interesting perhaps is to reflect upon the assumptions one has built in order to construct an entire narrative from a vague tidbit. Urrutia capitalizes on this tendency, or as Barthes might argue, this inevitability, of a reader bringing previous experiences and therefore assumptions to a text.